What mom doesn't dream of simplifying? Reducing to the common denominator to slow things down. Simplifying means less stuff to take care of, right? 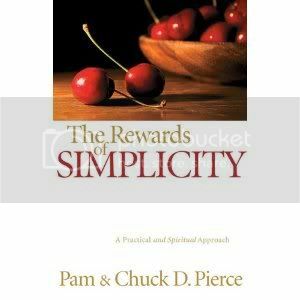 True, but The Rewards of Simpliciy by Pam & Chuck Pierce argues that while simplifying clutter and schedules are important, the value of simplification lays also in our spiritual lives. Putting into practice faith, focus and function to clarify God's purpose and calling in our lives, and putting legs to it! While the book holds a lot of interesting ideas, the writing is mediocre. I struggled through all the personal examples that made it seem like a biography. There were a couple of places where I disagreed with some theology issues too. So, common denominator, simplificated (is that a word?) review - Not worth your time. There are better books out there that say the same things. Pam and Chuck D Pierce are ordained ministers and have been married for 36 years. Chuck serves as president of Glory of Zion International Ministries in Denton, TX and watchman of Global Harvest Ministries in Colorado Springs, CO. Pam has ministered within the Body of Christ much of her adult life. She is currently a fourth and fifth grade teacher while maintaining the lively Pierce household. This book was provided by Bethany House Publishers for review.